The ladies event at Worlds is one of the most exciting of the last years. There is not an established leadership among the ladies, so that everything can really happen. It was back in 2008 when the all current favourites for a podium finish medaled at a World Championship and for many this is going to happen this year too. Mao Asada won her first world title at that event, which she repeated at 2010 Worlds, but since then she has never finished on the podium again. She has had a couple of troubled seasons where she tried to rework her jumping technique and only from this year she has been quite consistant. Her skating at Four Continents proved that she can definetly be a contender in London and maybe get a third world title. She will have very risky program, the short with an opening triple axel and possibly a triple flip-triple loop which she tried at Four Continents' free skate and the long program planned to be filled with eight triples. There is no doubt that with this kind of content she would surpass everyone else, anyway it will be very difficult for her to nail all of her jumps. In such a stiff competition, she will need to do a clean short program for winning. Figure skating has been missing Yuna Kim in this two years and now that she is back to the world stage, world's eyes and expectations will be on her. She is an amazing skater and a solid performer, and I think there is no doubt she will be on the podium, but it will take her some nerves for competing internationally after such a long time. The defending champion Carolina Kostner debuted later in the season too, but even if she hasn't competed against a world wide field she has had few opportunities for testing her programs. In the last years she adopted the "go clean" strategy and it has worked very well for her. She is going for a simpler short program than her rivals, as she plans a triple toe-triple toe and a triple loop so that, even with the enormous potential her well skated performance could bring her (that short earned 72 points at Challenge cup and 64 at European Championships with a fall on the combo), I doubt she will rank first after the first segment of the competition. Her free skate is much riskier as she attempts a triple lutz and a triple flip-triple toe. If she skates clean she will be challenging for gold. Akiko Suzuki and Alena Leonova, defending medalists from last year, shouldn't be counted out in this event. Akiko Suzuki is having a great skating moment now and her programs are just delightful. She had some off competitions in late December, early January but she looked strong and confident at Four Continents. Alena Leonova has struggled a lot in finding her place among all the newbies finally age elegible. She didn't compete at European Championships, but she had a nice showing at Russian Cup where she earned a world spot. And finally, here they are. Adelina Sotnikova and Elizaveta Tuktamisheva are definetely senior now and they won't spoil any occasion for doing well. They are both very strong in their own way, Adelina with great skating skills and a natural joy for skating, Liza with monstrous jumps and a fighting charactere. I would expect Elizaveta rank the best of the two, but Adelina showed a unknown consistency at European Championships so that it will all come down to who skates cleaner. Gracie Gold is the US response to the Russian babies. She has everything she needs to become a star, but she needs to grow up and experience competitions. And that is the main reason why the American expectations will be for Ashley Wagner. In November Ashley looked the girl who would have been the next world champion as she was terrificly consistant and mature. Anyway, her skating performances at Grand Prix Final and Nationals (and the progress of others) redimensioned the feeling on her. She is planning to do a triple flip-triple toe in the short program, which she hasn't tried all season and that could equally lift her to the podium or bury her (as it somehow happened last year). She has a great fierce and personality that will help her with the fight for a medal finish. 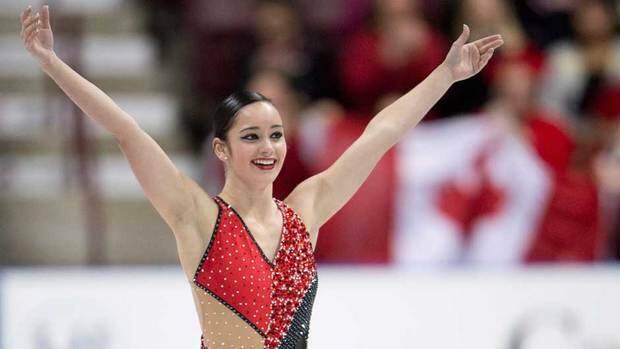 Kaetlyn Osmond is the fresh new face that skate Canada was looking for. She astonished anyone this year by winning Nebelhorn Trophy (ahead of Sotnikova), Skate Canada international and Canadian Nationals. The home crowd will surely support this amazing and joyful skater aiming to regain two spots for the 2014 Olympics. I agree with your prediction!!! With due respect to Mao, it's her competitive records that were consistent, but her jumps were actually as inconsistent as the last year. 3F combo: 7/12, 3Lz: 2/4, 2A-3T: 1/4, 3S: 1/4. In official practices, her success rate on the 3A has been 15-30%.